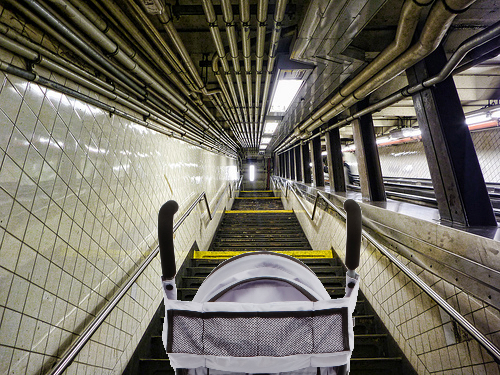 What is the best way to go down the subway stairs with a child and a stroller? But parents think it’s a great question and invariably have the answer and a few tips. I recently was taking my two-year-old daughter into Manhattan; she’s a good walker but walking several blocks necessitated the stroller. With my daughter’s hand in my right hand and the stroller in my left, walk down the stairs step-by-step. Of course, if it is busy and you are taking up two-thirds of the staircase as you amble down the stairs, you will need to dodge the daggers coming from the eyes of busy commuters because your little brat added a few more seconds to their commute. Grab your kid under one arm, stroller in the other, and hurry down the stairs. This is dangerous, as a flailing child could send you off-balance and tumbling down the stairs, and even if you do get down safely you’ll need to dodge the daggers coming from the eyes of busy commuters angry at someone who’d carry this darling angel like a loaf of bread. Pop a wheelie, and bounce on the back wheels down the steps one-by-one. Note: Depending on the weight of you child and the amount of junk you keep underneath (I usually pack like I’m loaded for bear), this method may render the stroller inoperable; since the SoHo Maclaren mechanic went out of business, you’ll need to buy a new stroller. Just grab the left and right sides of the stroller with your child strapped in, yank it up (thanks to the awkward position you end up lifting entirely with your back), and muscle her down the stairs. Make sure your chiropractor has a tenth-visit-free option if this is your lifting choice. Stand at the top of the stairs looking helpless until someone helps you portage the loaded strolled down. Note: This does not work with men. I opted for “The Muscle” ….then a cab home. How do you get down the subway stairs?